A Fun Resolution for the New Year…and a Give-Away! I’d never really been much for New Year’s resolutions, but that New Year’s Eve, I resolved to spend the next year learning as much as I could about all these different types of threads, and to learn how to handle them on my sewing machine. Little did I know that this was the beginning of one of the most fun journeys I’d ever taken! 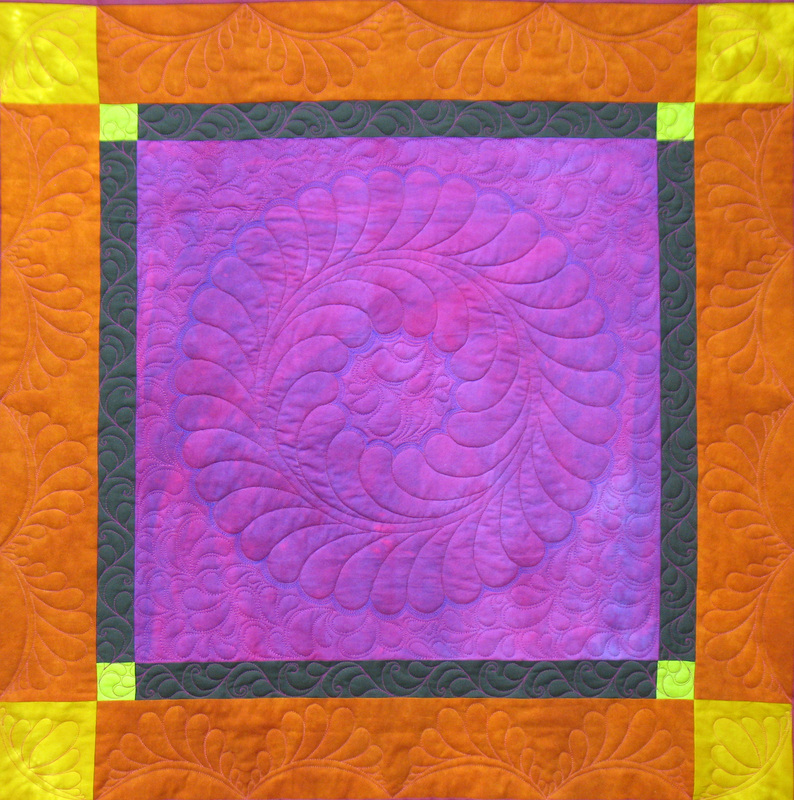 Playing with different types of threads to create texture and dimension and colorful embellishments to my quilts has enriched my quilting life in ways I could never have imagined. Since then, I’ve been making a “fun resolution” every New Year. I’m bringing this up because there’s something about putting a task on “project status” that seems to ensure getting that task done. Most of the time, I do this with tasks that I really don’t necessarily want to do, but I need to do. 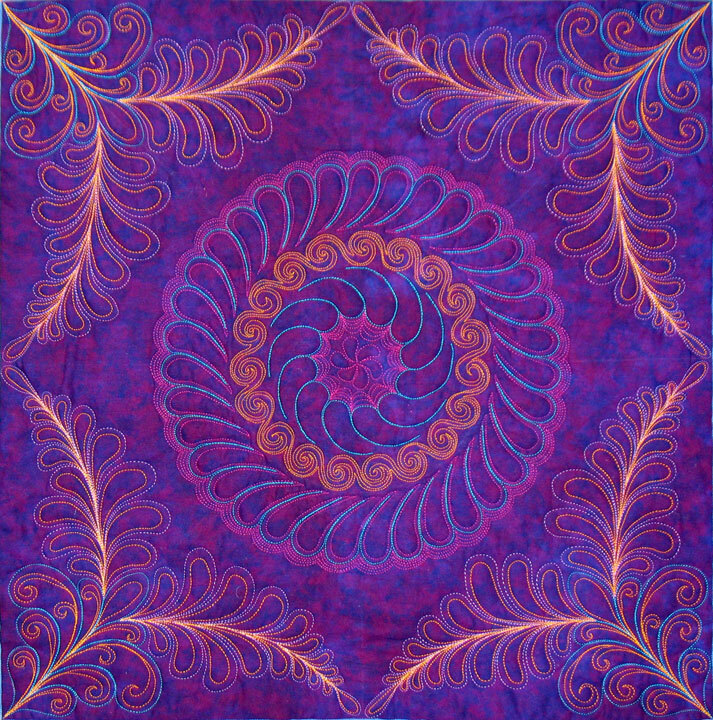 In quilting, there are all kinds of things I’d love to do, but they take a lot of time, so they keep getting pushed into the future. That’s where making a “fun resolution comes into play. It’s a combination of making a commitment and giving yourself permission to devote time on a regular basis to learn something you’d love to learn but keep putting off. Every time I’ve made one of these fun quilting resolutions, it’s paid off for me in spades, so I’m hoping it will work that way for you. So, where am I going with all this? 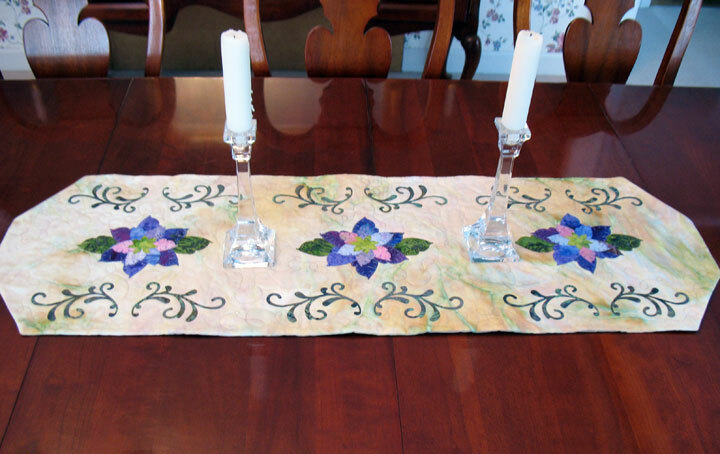 Do you find yourself surfing web sites and blogs and seeing all kinds of quilt photos where you’re wondering how a quilter created some interesting quilting designs? 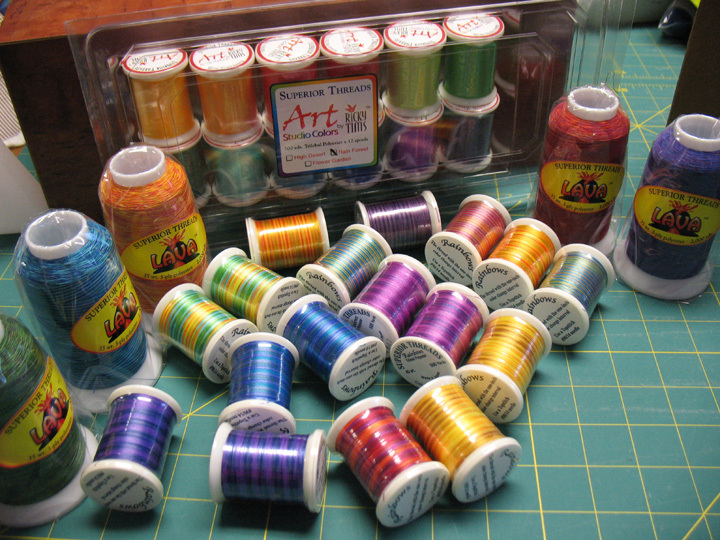 If you’d like this thread (4 spools of YLI variegated cotton and 2 spools of King Tut variegated) and are willing to pay shipping, you can enter the give away simply by posting a comment to this blog post telling me what you’d like to learn about free motion quilting over the next year. Entries are open until 11:59 pm eastern time on Wed 1/12/12. 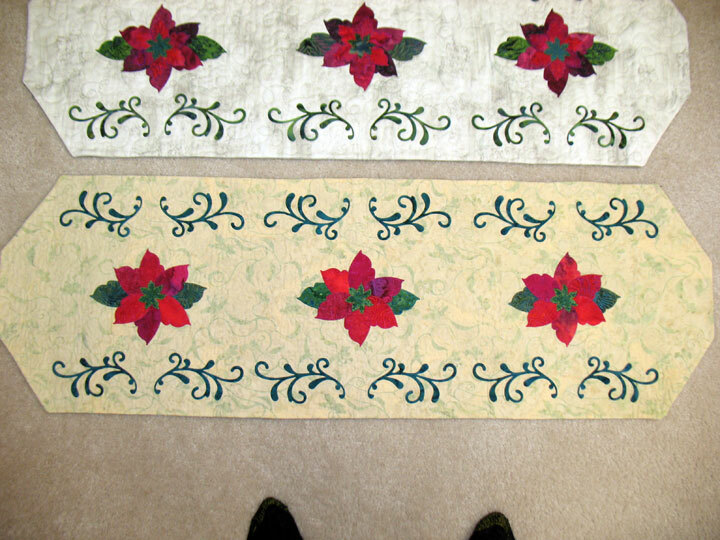 Both of the blocks shown here were stitched using Floriani Polyester embroidery thread in the top needle and Superior Threads Bottom Line thread in the bobbin. I got a number of emails asking what size thread this is and it’s only a 40 wt thread, which is pretty average sized thread. 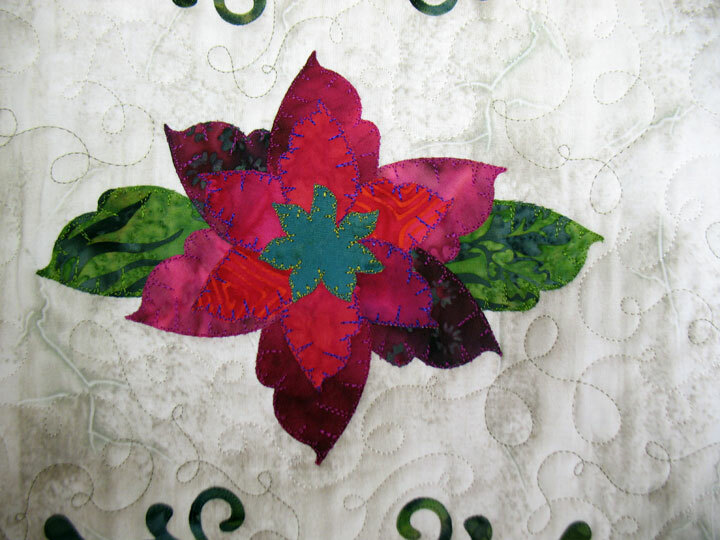 The lesson here is that the 3-dimensional nature of this kind of thread work is a function of the programmed embroidery stitches, not the thread weight or size. The wonderful thing that this thread does offer here, though, is a great sheen. I mean a really great sheen! 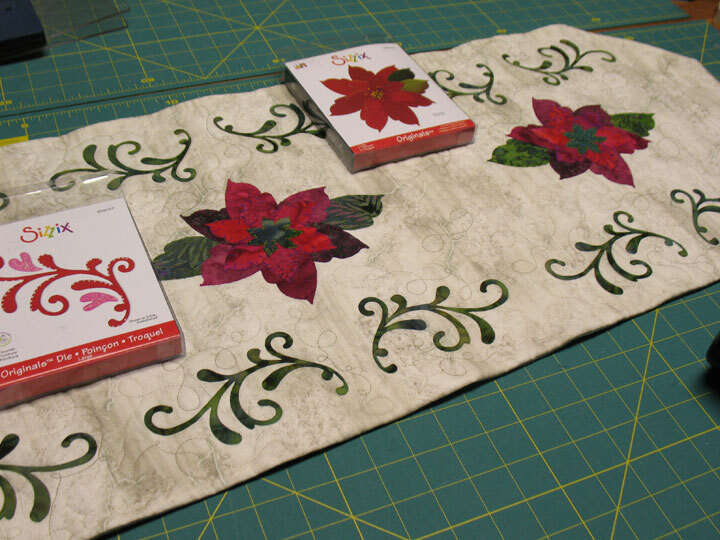 I you’re thinking of trying out some Floriani thread, know that Kelly at I Have a Notion is having a great sale on Floriani thread during this holiday season and you can read about all her Floriani specials here. 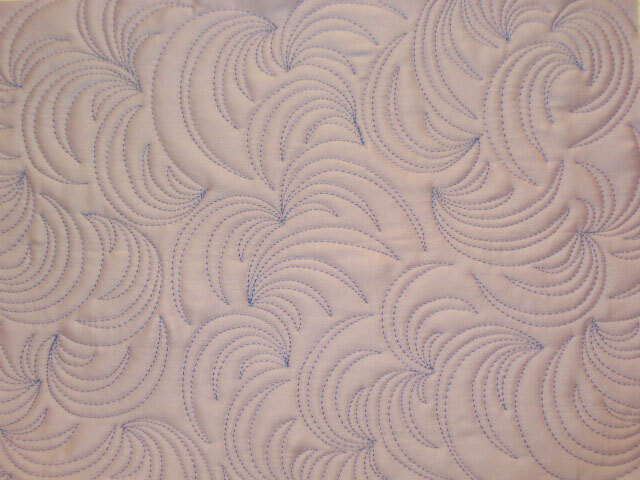 These plume badges were embroidered with Isacord Polyester Thread. I like how they came out as well and am mulling over what I’ll do with them. 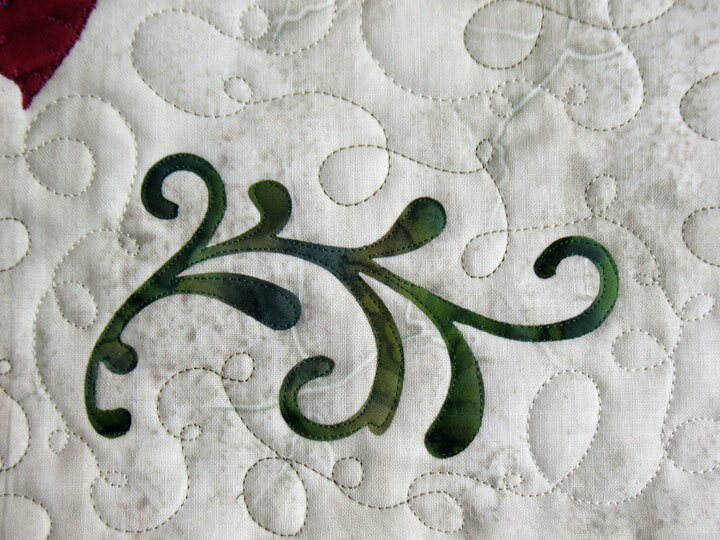 I just can’t get over how much thread work can add to a design! I’ve barely done any Christmas shopping and plan to make some real headway tomorrow. If you’re still looking for some great gifts, we’ve got a wonderful special in our online store now. 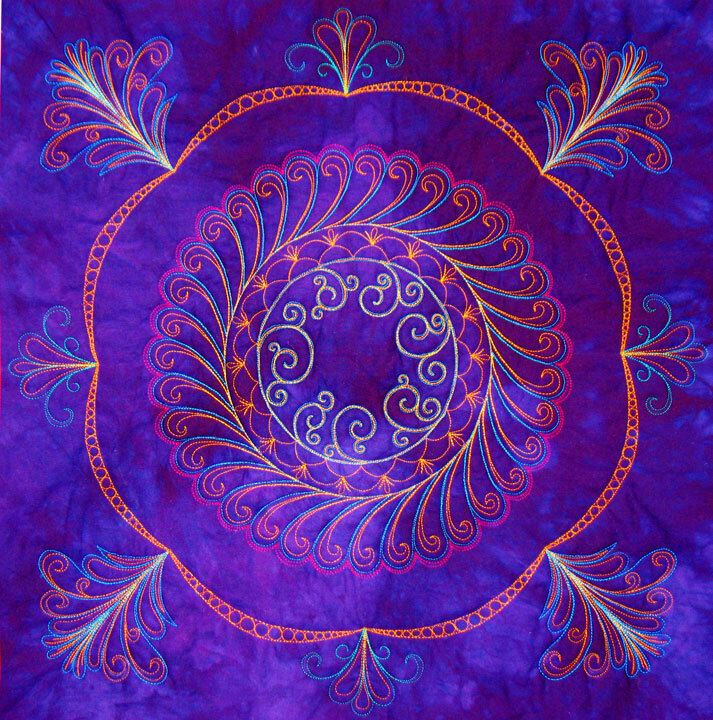 All products made by Patsy Thompson Designs are 20% off the normal retail price through 6:00 am eastern time on 12/19/11! This means that any of our DVDs, books, stencils, Appli-K-Kutz dies, and patterns are 20% off! To get the discount, enter “Holidays” (minus the quotes but with a capital H) in the discount code box during checkout and the discount will be applied in the last stage of checkout. 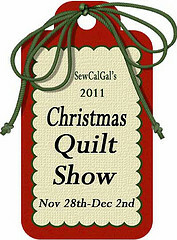 Welcome to the 2011 Christmas Quilt Show, coordinated by Darlene of the Sew Cal Gal blog! If you haven’t already been following this wonderful collection of Christmas and/or winter based-projects, you need to start hopping to all the different blogs that are participating in this show! Not only will you find loads of inspiration for making your own projects, but you can also win all kinds of great prizes. 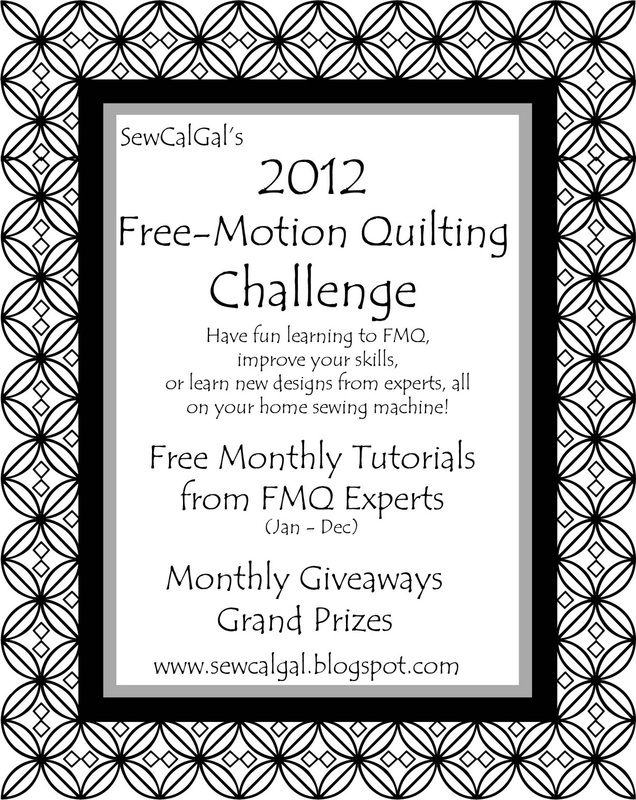 Make sure to head back to the Sew Cal Gal blog here to find out just what you need to do to participate! 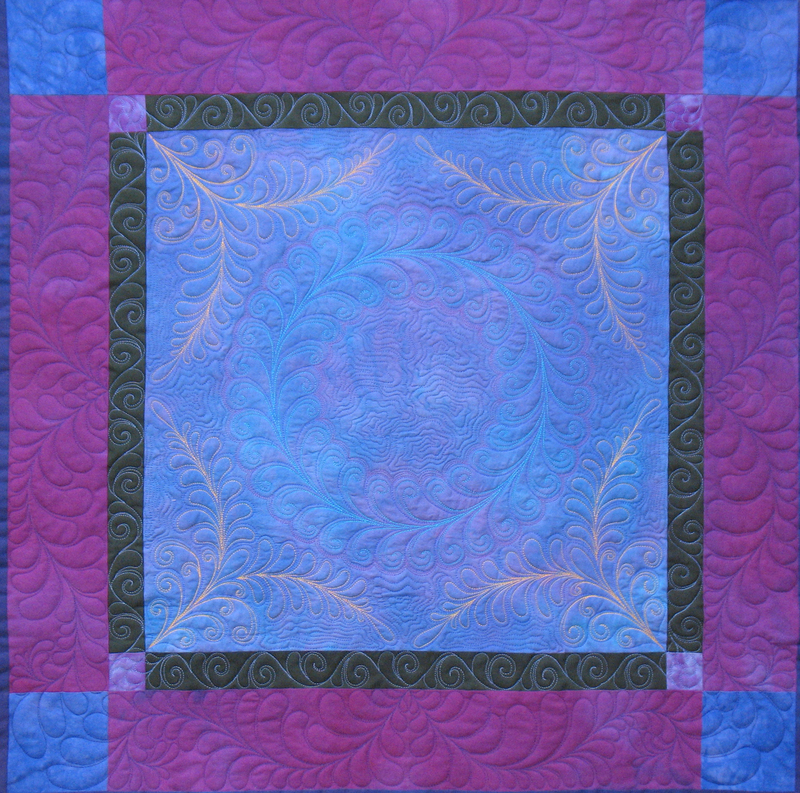 …and I quilted the background using a simple loop-d-loop quilting design. 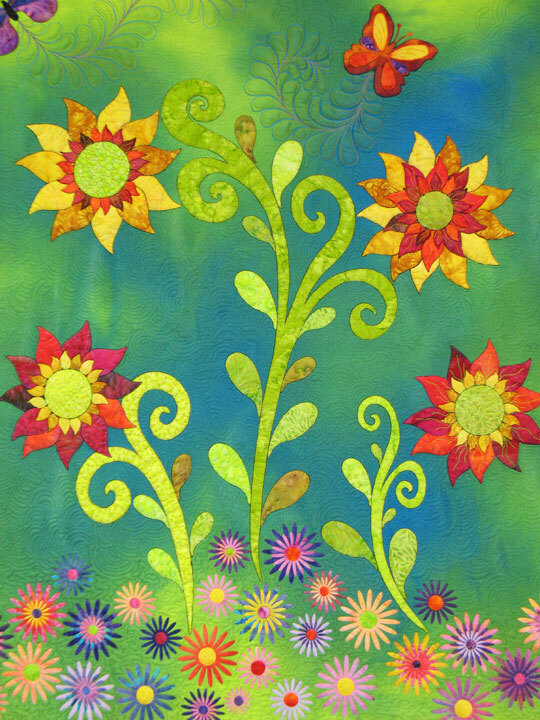 You can find a line drawing of that quilting design and many other quilting designs on my web site here.